Start by marinating the beef: mix all ingredients in a bowl, add the pieces of beef and stir to coat the slices. Let it stand for 10 minutes, while you prepare the sauce and blanch the broccoli. Make the sauce by mixing the oyster sauce, rice wine (or sherry), soy sauce, and chicken stock (or water) in a small bowl. Reserve. Place the broccoli in boiling salted water for 2 minutes. Drain very well and reserve. Now, the fun begins: heat a large frying pan or wok over high heat until a bead of water sizzles and instantly evaporates upon contact. Add the cooking oil and swirl to coat. Add the yellow bell pepper and cook it for a couple of minutes until it begins to soften. Remove and reserve. Make sure the pan is again very hot, and add the slices of beef, spreading them out all over the surface of the wok or pan in a single layer (preferably not touching). Let the beef fry undisturbed for 1 minute. Flip the beef slices over, add the garlic and reserved bell pepper to the pan and fry for an additional 30 seconds to 1 minute until the beef is cooked through. Pour in the sauce, add the blanched broccoli and bring to a boil. Pour in the dissolved cornstarch and cook, stirring, until the sauce boils and thickens, 30 seconds. This dish highlights well how a couple of extra-steps that might seem like a waste of time and energy make a world of difference in the final product. 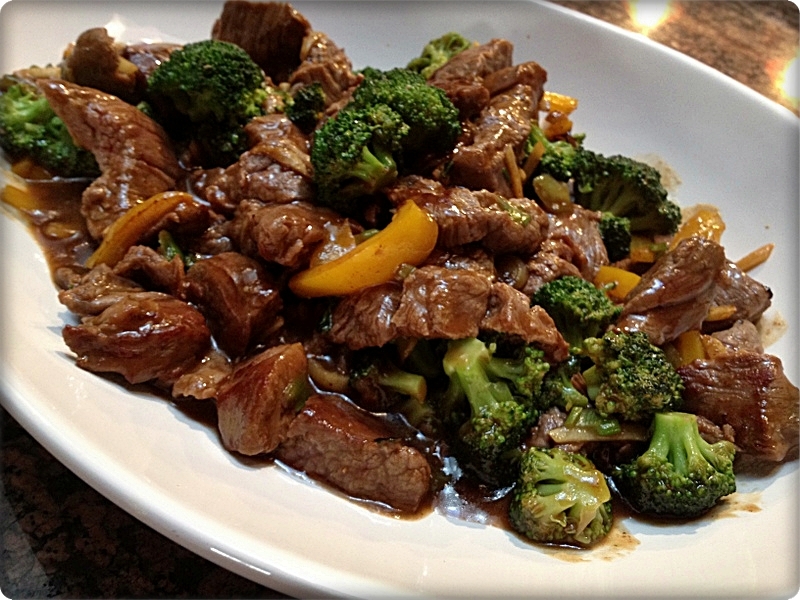 If you skip the beef marinade and blanching the broccoli, it simply won’t be the same. The original recipe does not call for yellow bell pepper, but I wanted to add a bit more color. You can certainly omit it. This is a great dish for weeknights, all you’ll need is some steamed white rice. Meat, veggies, carbs, all there in perfect harmony: the omnivore’s dream! If you are fond of Asian recipes, make sure to stop by Jaden’s blog, The Steamy Kitchen, and consider getting her cookbook, I have it and love it! One of my favourite stirfries: yet I sometimes hesitate to use the broccoli and go the safe zucchini/bok choi/red onion/bell pepper route instead. Do have a certain amount of trepidation in getting both heads and stems of broccoli cooked at the same time with the meat just perfect! Onward trying!! Thanks for the tip! Shall use 🙂 ! Methinks it’s great we all are so different: broccoli always has been just about my favourite vegetable, followed by eggplant [aubergine] and asparagus!! To me the darling vegetable is best steamed, then finished with a tad of some homemade Asian sauce! I don’t use broccoli enough in my cooking so I would never omit it in a dish like this. Zucchini … not really my thing though I love bok choy. Great veggie additions as a previous poster said. And I like the bell pepper though I’m more likely to pick up a bright red one rather than yellow. 🙂 A yummy dish all around. I used the yellow because that’s what I had in the fridge, I actually had bought one red and one yellow, but the red was gone ;0) I think red would look even better! Broccoli is evil and must be destroyed. I’d rather eat AIDS. When I come to power eventually as the anti-Christ, my first edict will be to kill all broccoli…and its minions. You have been warned. I’ll make Beef and Gummy Bear Stir Fry, thank you. I wish I could find a blog post I read last year, a guy listing the 10 foods he would like to have banned from the universe, and broccoli was his number one. His description of the taste was priceless, I laughed to the point of tears. Your brother, maybe? Long lost brother? If I retrieve it, I will send you by email, you will love it! in the meantime, I’ll work on a recipe for beef and stir-fried gummy bears for you! Anything to please my readers, you know…. No brothers, but I do have several clones. I wouldn’t be surprised if one was the scribe. Each of us would step over our dying mother to punch broccoli in the nose. Looking forward to that recipe. Don’t forget to match it with a good wine. Gotta be a nice Pinot Noir. You need to allow the gummy bears to shine a little, without obscuring their complex flavor. Velvet in your mouth sounds worthwhile to me! And it sure looks great Sally. I will try your steps and see if I can get the same results (I think the quality of the meat is also a huge factor). I wonder if I can substitute fish sauce here…I like my broccoli! (it reminds me, there’s a fellow in our neighbourhood who greets the kids on Halloween as ‘broccoli man’ – he and his wife (licorice lady) do a little skit… very sweet ;-)). You should try to snap a photo of this couple during Halloween – seems too cute not to share! Here I am thinking of how much work I have to do tomorrow and how little time I have for cooking and this wonderful recipe comes to the rescue! I actually have all the ingredients! the whole family LOVED it. Sadly I didn’t have the time to take pictures this time but I am sure I will make it again soon. I’m all for adding the yellow pepper for some color. I wonder if I would enjoy broccoli in a stir fry. I’m usually not a big fan unless it’s covered with cheese. That said, I do love a good stir fry and this sauce sounds nice and tasty. I love oyster sauce! 🙂 Maybe a good way to get me eating more broccoli. Have a great weekend Sally! Growing up, we made chicken and broccoli stir fry all the time. I would love to try it with beef. This looks healthy and flavorful. Thank you for sharing. A lovely way to begin my Sunday. I hope you had a fabulous weekend…and I wish you an even better week! I’m definitely not a broccoli hater! I love it stir fried after blanching too. I’ve been thinking I should try to grow some since I buy so much of it! This dish sounds like another winner, Sally. I used to make stir fries at home but gradually stopped. This dish sounds like a great way to get re-introduced. Thanks!